Please refer to our stock # TD00191 when inquiring. 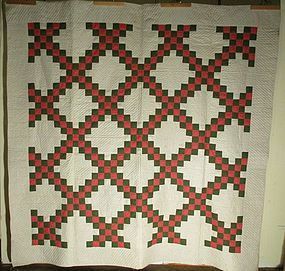 A double Irish chain quilt with printed cotton fabrics of red and green chains against a background of black spots on white cotton. The front is turned over to the back to make the edge. The quilting is simple diagonals. Good colors and pleasing design makes this an attractive quilt.